Last week my daughter came home with a note from her teacher explaining that there was a big social studies test the following week. The children were to study the content in their social studies binder each night for review. We reviewed the content the first night, the second night I traveled out of country, the third night I sent home an email in the middle of the night reminding her to study, the fourth day she forgot her social studies binder at school, the fifth day she forgot it again despite her father’s reminder for the second straight day and then the weekend hit. No social studies binder, no studying. It was obvious to me she was woefully unprepared and I used this incident to drive home the importance of studying and being prepared. “You had lots of time”, I reminded her. “It is your job to stay on top of your studies, not mine.” “You will regret not being more prepared. I just hope you can make it up this year.” I pulled out every “mom-ism” I had in my arsenal because frankly lessons like this are an important part of growing up. As a mother, it’s my job to make sure my children understand that for every action there is a reaction. Don’t study, fail your test. It’s that simple. Today she came home with her test. 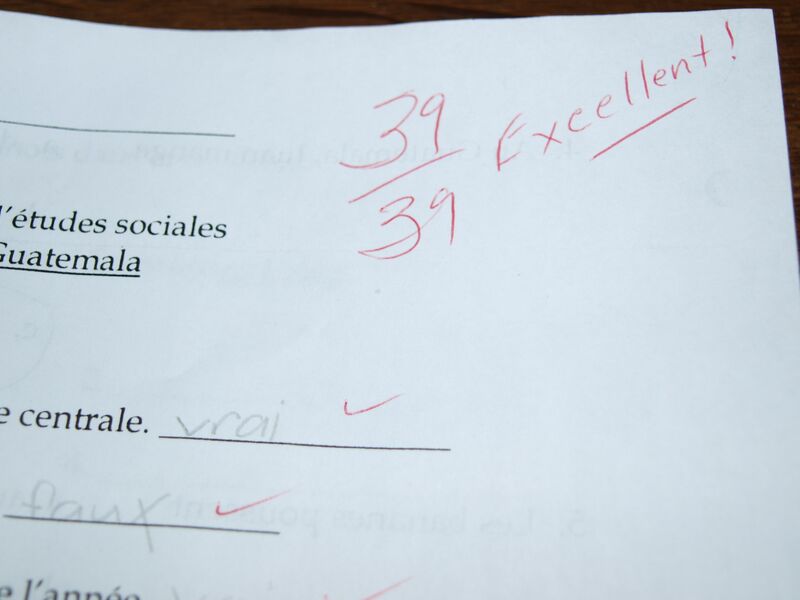 She received a perfect grade. Perfect! I’m sure my daughter has learned a very valuable lesson from all of this. Argh! This is my problem with our son. How am I supposed to sound like I know what I’m talking about when this happens? I’m still looking for my parenting manual. Have you found one yet? Instructions for this type of thing would be nice. Ba ha ha hahahahahaha….errrrr…..I mean, I’m sure she learned something very valuable from this. I have this constant struggle with my 17 year old, wrote a post about it too. He won the homework fight because he received a university scholarship. I wish I had the answer. Part of me wants her to fail so that she understands, on the other hand I’m pleased she did so well. Conundrum.